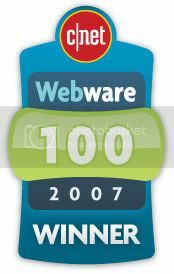 Yesterday’s iPhone craze was widespread and well known. 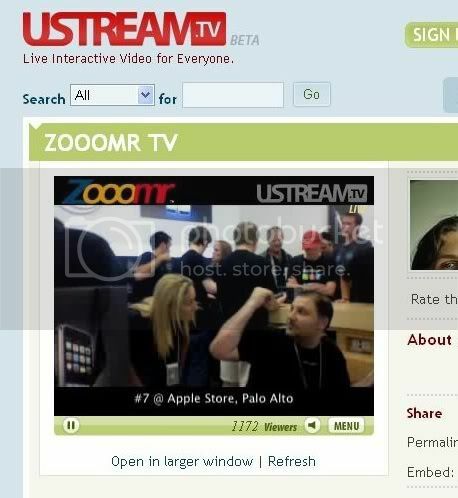 Ustreamers across the country covered the event live from NYC, to the Technology Evangelist at Mall of America in MN, Entercourse.TV in Dallas, to iPhone Ustreamers in San Fransisco, to ZooomrTV in Palo Alto CA, to our Ustreamers in Hawaii. 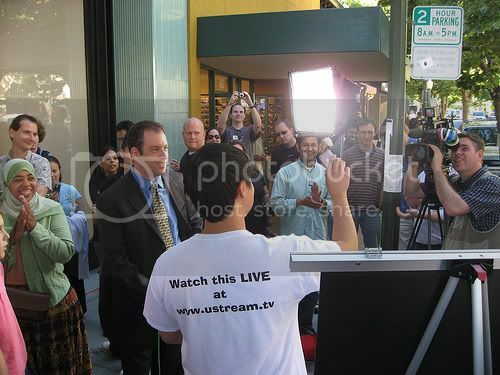 In total, over 70,000 viewers watched and participated LIVE in the launch of Apple’s iPhone. 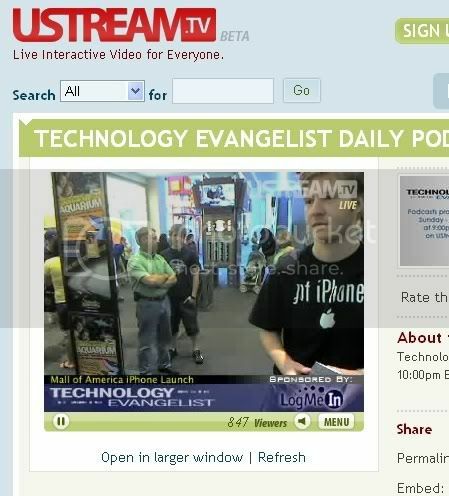 Special Congrats to the Benjamin Higgebotham and the Technology Evanagelist who were the FIRST Ustreamers to break 1,000 simultaneous viewers. 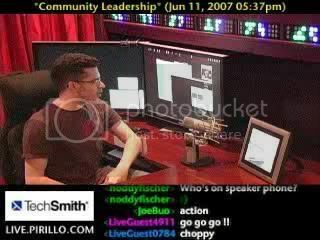 One hour later ZooomrTV accomplished the same feat. 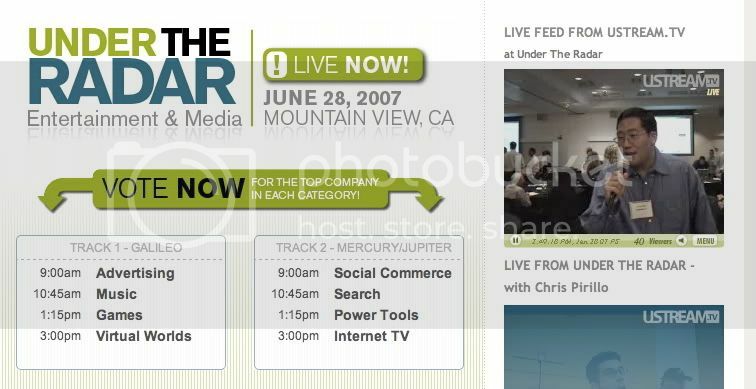 Ustream.TV today won the “Viewer’s Choice” Award in the INTERNET TV category at the Under The Radar Conference in Palo Alto, CA. 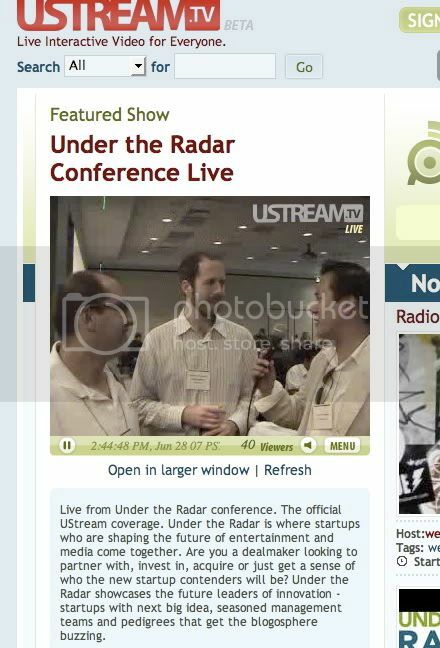 Ustream.TV covered the event LIVE streaming all the presenting companies and panels from the Microsoft Offices. 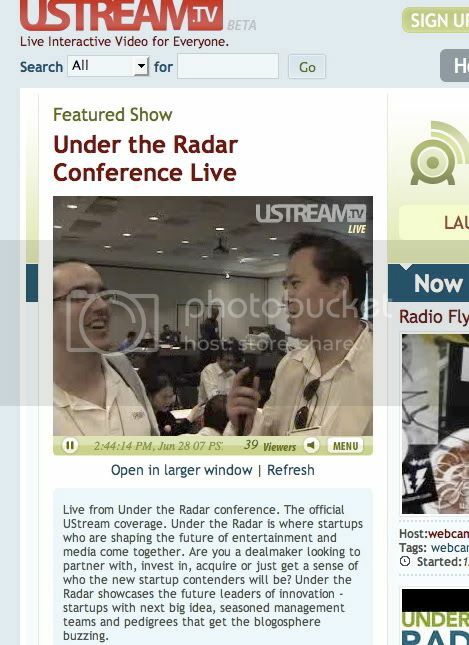 The Under The Radar Conference is where startups who are shaping the future of entertainment and media come together. 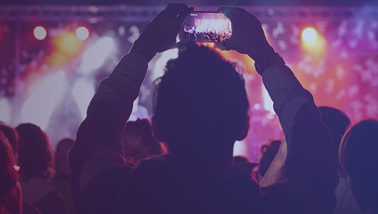 The conference showcases the future leaders of innovation – startups with next big idea, seasoned management teams and pedigrees that get the blogosphere buzzing. 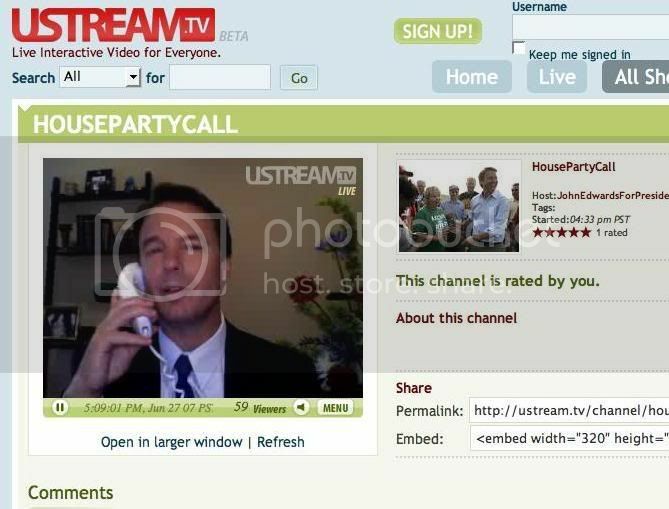 In yet another example of Ustream.TV impacting the political processes of our country, Presidential Candidate Senator John Edwards streamed LIVE to his base of supporters on Ustream.TV yesterday. In his “Its Time To Party For Change”, the Edwards campaign sponsored hundreds of house parties across the country. 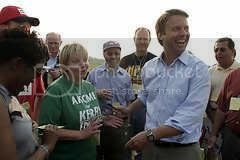 Thousands of Americans gathered in living rooms to join John Edwards’ campaign to change America. 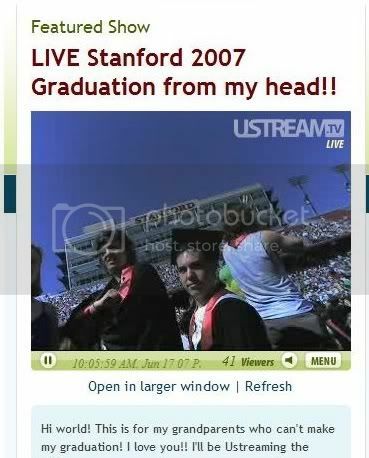 This is democracy, LIVE. Senator Edwards was joined by his wife Mrs. Elizabeth Edwards to discuss the issues, build local support, and talk live with their supporters. 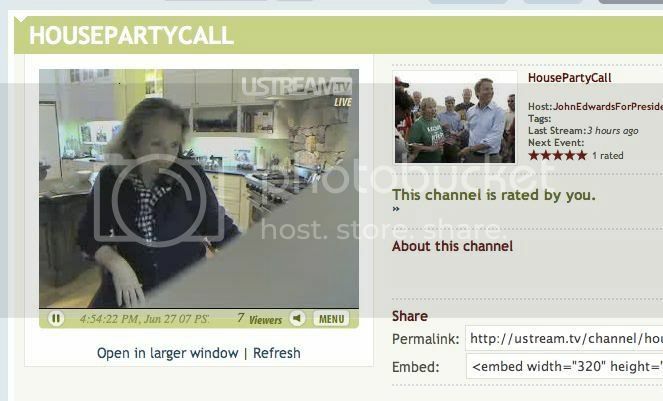 Each house party was able to talk live with the Senator and Mrs. Edwards. 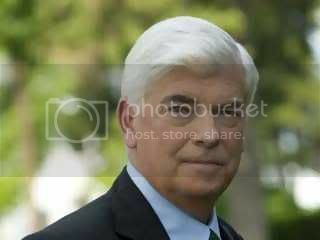 For most of these supporters, it was the first time they were able to directly interact with the Senator. 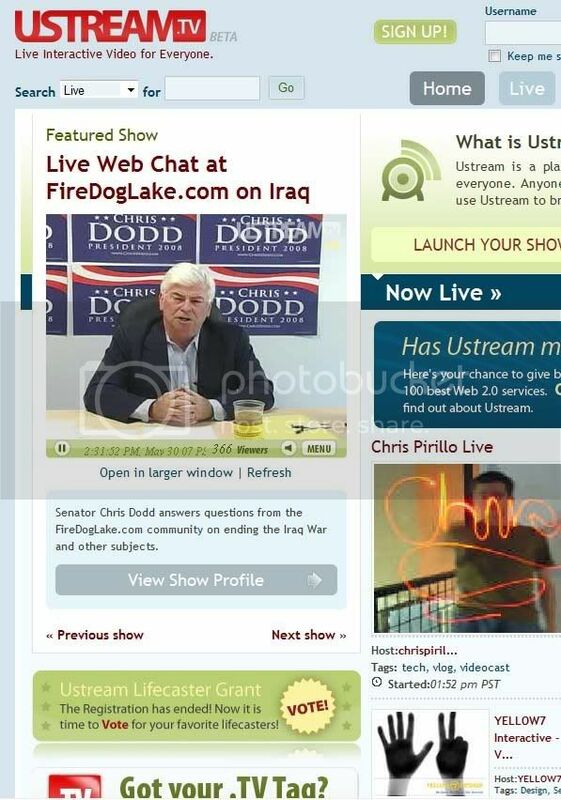 Another Presidential Candidate Senator Chris Dodd has streamed LIVE on Ustream.TV on several occasions in the past leveraging Ustream.TV’s LIVE platform and rallying his base. 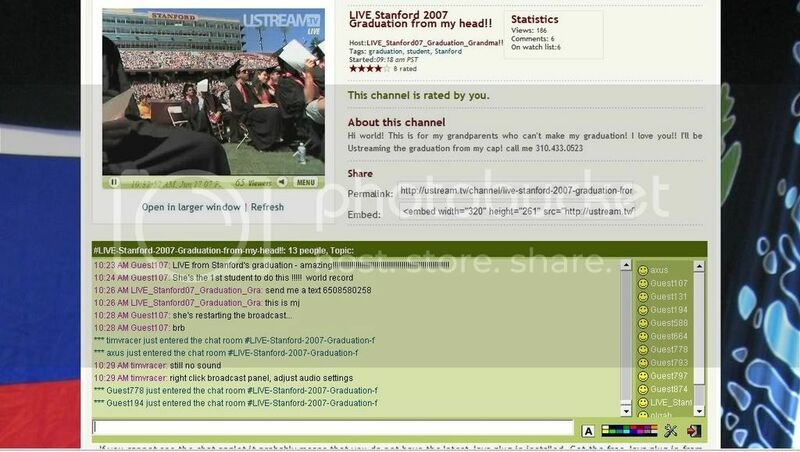 ustream.TV has also seen the Young Democrats of Atlanta stream their conventions and politcal activists stream their rallies.